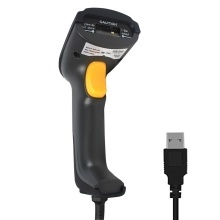 This Is a Wired Barcode Scanner with excellent performance, is a good helper for cash register and is widely used in O2O payment business, express logistics, supermarkets, shopping malls, pharmacies, warehouses, libraries and other places. Dual mold design, durable, ABS shell, made of environmentally friendly materials, anti-seismic and anti-falling. Mainstream USB communication keeps you away from installation driver troubles and truly plug and play. Perfect compatibility, all kinds of systems ( mobile phone / computer / screen dedicated, QR code can be solved ). The continuous scanning mode is convenient and quick, and the scanning gun does not need to press the scanning key to scan continuously. Using a new generation of decoding chips, video cameras, powerful capture mode and wider scanning range.